What Is BANT And How Can It Enable Your Sales Team? Ever hear the term BANT? If you've spent much time around marketing and sales initiatives, chances are you have. In fact, chances are you've heard it more than a few times. As with most acronyms, people tend to assume everyone already already knows what it stands for, but that's never really the case. With this in mind we're going through BANT letter for letter to find out what it means and how it can enable your sales team. Well, perhaps not quite. Without context they're just words, and although words like budget, authority, needs and timeline may sound important, they're not effective on their own. Let's start from the beginning, shall we? BANT can be defined as a B2B lead management process. 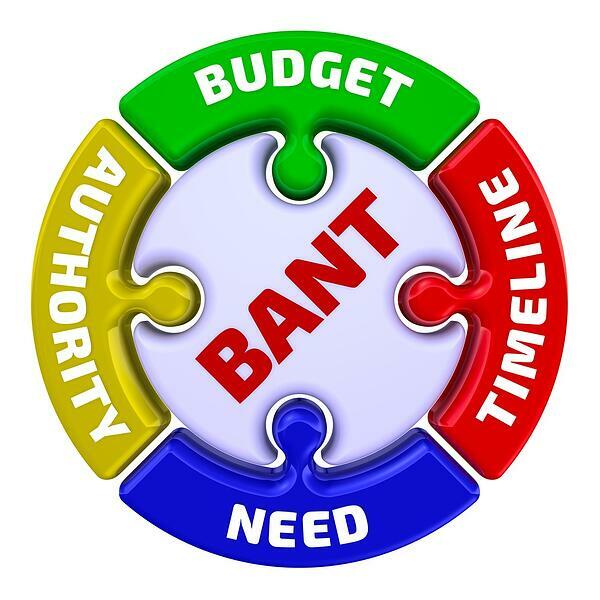 BANT (budget, authority, needs and timeline) is a system used to assess the quality of a prospect. Once we've identified a prospect's quality based on the BANT criteria, we can use this information to prioritize sales leads and pursue those that are most qualified. It's always a wonderful day when a prospect's budget is perfectly in line with the actual cost, but there are many cases where it's just not going to work out that way. Sometimes their budget is based on what they personally feel the value should be. Sometimes it's based on interactions they've had with your competitors. Sometimes they don't have a budget at all, which may be an indicator they're not a serious buyer. How budget enables your sales team: Asking the right questions and getting to the bottom of a prospect's budget enables you to develop a sense of their qualification. If the budget doesn't line up with the cost of your solution, it may not be a match. But use best judgement here, because sometimes they can still be won over. Sometimes we work directly with a person of authority from the beginning, but a lot of times we work with someone further down the ladder. The idea with this part of BANT is to figure out who the final decision makers are. The knowledge you gain shouldn't trigger you to stop speaking with anyone who doesn't have the final authority, but it should help you understand where the final signature will be coming from. How authority enables your sales team: By getting a clear view of how the decision making process works, you can identify decision makers from champions/advocates, and use this information to better support your sales efforts. If you don't know the chain of command or who you need to have buy-in from, your efforts won't be as effective and efficient. Knowing who to speak with, when to speak with them and how to speak with them, is highly dependent on knowing authority level and chain of command. Need is a big indicator of whether or not there's an alignment between your prospects' pains and your solution. It is an important topic to explore deeply because sometimes prospects think they know their pains, but their real pains are very different from those they've identified. Take the time to understand their true challenges. Those are the places where your service will make their life a little bit easier. How need enables your sales team: Once we gain insight into a prospect's needs, we can understand how to best position our services. Such insight not only helps further qualify the prospect, but offers us a strategic position in the way we communicate and close the prospect into a customer. Sometimes a prospect is a great fit. They have the budget, the authority to approve and the need, but the timeline is off. If the timeline is too short, it may not be feasible to accommodate the request, or it may not be within the budget to do so. If timeline is too far out, it may mean the prospect doesn't identify this as a priority. How timeline enables your sales team: Clear expectations for both parties are the key to success. When sales knows the expected timeline, they can work to ensure resources are in place for when the sale closes. Doing so creates less friction in the transition from sale to delivery, which also provides better customer service. Once timeline is established, and agreeable, sales can confidently determine the prospect's qualification. BANT is a lead management process used for sales qualification. It stands for budget, authority, needs and timeline. Someone using BANT in their inbound sales process will ask specific questions designed to uncover these four criteria. Based on the prospect's answers, the lead can be prioritized and pursued accordingly. While BANT still has relevance and continues to be used, many inbound-focused marketing and sales teams have adopted alternatives such as GPCT (Goals, Plans, Challenges, Timeline), which shifts the focus from the seller to the buyer. The GPCT process attempts to offer more value up front while keeping the focus on the prospect's needs. Regardless of which process you choose as your sales qualification framework, always ensure you're offering value to your prospects while working toward appropriately qualifying them. Ready to learn more about the sales process and inbound selling? Download our Complete Guide to Inbound Sales! James works on New Breed's internal marketing team and specializes in video marketing content strategy and promotion.